Visit Bozeman Montana on your next trip to the west. Summer or winter, no matter the season this destination has a wide variety of activities and attractions to explore and enjoy. 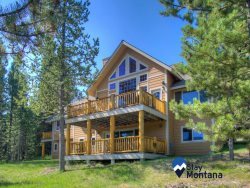 Take in the magnificence and beauty of Montana from the deck of any of our well-equipped vacation rentals, the view will be sure to whisk you away! If you're in search of rest and relaxation our mountain rentals will provide just that and so much more. Interested in visiting the Bozeman area of Montana? We have all you need in one place to start planning the ultimate vacation. Browse our resources to get started! If you need additional assistance please contact Stay Montana, we are happy to assist you. Bozeman is at the confluence of many geographical features. The Bridger Mountains, Tobacco Root Mountains, Big Belt Mountain, Horseshoe Hills and much more all surround this beautiful area. With warm summers and typically cold, snowy winters Bozeman gives way to lush vegetation. Day to night temperature changes can be significant. Bozeman is hoppin' in the summer! With numerous events and festivals taking place like the the Sweet Pea Festival and MSU Graduation, unless you are attending one of these events there are other less busy times of year to visit like fall. Fall is an ideal time to visit the Bozeman as area temperatures are milder than summer and the crowds have died down. Come wintertime, be ready for snow! The area can experience early snow and it can get deep fast which is great news for skiers, boarders and winter sports enthusiasts! There are many options when traveling to Bozeman. From regional airports to ground transportation, you'll get exactly where you need to go. If you need assistance arranging transportation be sure to contact our office for guidance. Airport Shuttle, Uber, and rental car options are available from Bozeman Airport. Rental cars are recommended. Or check out our local shuttle service, Streamline Bus. Below find our most frequently asked questions about Bozeman. Find more information on surrounding areas here.